Designed by both the best park skier (Jon Olsson) and pipe master (Simon Dumont) in the sport, the North American Open sets out to set the standard for open competition format. Instead of the typical two run format, all competitors will have the privilege of a full day jam on a course hand built by Jon Olsson himself. Jon has assured that all the jumps will be big enough to throw any trick but at the same time be as safe as possible for the riders. Not only will this be a chance to ski a great course but also a chance to meet and ski with various pros. As an added privilege, all competitors are free to ask any of the pros questions or advice throughout the jam. Competitors will be hand picked from the jam by either Jon, Simon or TJ Schiller. Once qualified, judges from both the X Games and the Jon Olsson Invitational will select a winner from the finals. The focus for this new competition format is more on having fun than it is competing. Hopefully all who compete will have a good time and want to come back and ski in the comp next year. If nothing else they should be excited to ride the one of the best courses ever built for a slopestyle. For more information and video check out the Open Freeski Website. Hunting Yeti is a new film project that’s being released from pro skiers; Pep Fujas, Andy Mahre, Eric Pollard, Eric Iberg and Chris Benchetler. It all began last year when Andy, Eric, Eric, Pep and Justin Wiegand came up with the idea to try and bring the viewer into the process of filming and getting shots for a ski movie. Last season they produced possibly one of the best ski films ever seen, Idea, which showed both the life-style of the sport and the story behind a ski film. They wanted to show more than just jump, jump, jump, perfect landings, grabs and lines. They brought something new to the viewer by producing a raw ski movie that the viewer can relate to. The story continues this year under a new company Nimbus Independent. In association with Poor Boyz Productions, Nimbus Independent brings you Hunting Yeti, a series of six movies. The concept is to bring all of us into what they are doing and how they push the sport. They will be releasing five webisodes for free and the sixth, a summary of the other five, will be available only on DVD. The first webisode is set to be released on Feb 15 and others will follow every two months. You can check out each webisode via the company’s profile page on Rip TV. Each of the four skiers push the sport in directions never seen before by others. Sure there are other guys out there pushing the limits and doing their part to progress the sport but, none quite like the Nimbus crew. Each member brings something unique to the project; from Pep Fujas buttering 30ft cliffs to Andy Mahre destroying back country hits switch, this is going to be the must-see film for the ‘08-’09 season. Male sure you get in on the action starting Feb 15. Reverse Camber Skis: Hype or Here to Stay? With so many new ski shapes coming out, it’s hard to know if it’s all just a gimmick or if they really are legitimately better. Most of these condition specific skis are pricey and for the average skier it’s too costly to buy a pair without knowing exactly what to expect. Especially considering the average skier probably doesn’t own more than one pair of skis, so it might make more sense to go with an all-around ski when they don’t know what they’re getting. In the ‘07 – ‘08 season they were a handful of companies that designed powder specific or reverse camber skis. Reverse camber is just that, instead of the traditional ski curving to touch the snow, reverse camber bends away from the snow. The idea in theory is simple, in powder your tips won’t sink, therefore making it much easier to ski the deep stuff. The concept isn’t entirely new, similar ideas such as swallow tails and over-sized tips have surfaced in the past. The original reverse camber ski was the Volant Spatula. Although it had a cult-like following, other manufacturers never caught on and the idea faded away for a while. That’s until Shane McConkey switched to K2 and they released the Pontoon. The idea seemed to spread like wild fire but, the question still remains, do they really help you ski powder better or not? If you are familiar with water skiing this concept has been around for many years. Water skis are banana shaped (reverse camber) in order to float the tips. The same thing exists with pontoon planes (hence the ski name Pontoon) so they can land on water. Being somewhat of a skeptic myself, I decided to give them a try and let me tell you it was the best ski decision I’ve ever made. Skiing a reverse camber ski in the powder is what I would describe as like floating on a cloud. It is its own little niche of the ski world and the difference is amazing. Not all that ski them will love them, but those that don’t are few and far between. But don’t take my word for it, talk to others that have skied them or demo a pair for yourself before you plunk down the dough. Some of this year’s reverse camber skis are; Armada ARG, K2 Pontoon, K2 Hellbent, K2 Seth, Line EP PRO, Drake, DPS Lotus, and the Salomon Rocker. The first annual Quiksilver Natural Selection wrapped up yesterday with Travis Rice standing atop the field. Travis himself came up with the idea for the contest a few years ago and has been trying to make it all come together ever since. The idea is that the contest gathers the world’s best riders for many of snowboarding’s disciplines; pipe, park, back country and all-around freeriders. 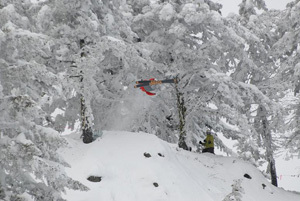 Featuring semi-natural hits and powder landings the contest showed a new direction for both the sport and contests alike. Riders threw variations of 180s, 360s, 540s and 720s through out the day including a few that opted to flip. Among the participants were legends DCP, Nicolas Muller, David Benedek, Gigi Ruf and other of the sports superstars. Pictures and Video coverage are available to those interested. Unique to the contest was a win-win situation for all riders who participated. All of them received prizes just to come and put on a show, regardless of who well they placed in the competition. With a combined purse of more than $75,000 in cash and prizes the contest went off huge. Rice, the overall winner donated a chunk of his $18,000 check to the Jackson Hole search and rescue and other charities in the local community. Other prizes included a snowmobile donated by DC Shoes for the best trick, won by Mark Landvik for his huge 720. Top three finishers received painted bison skulls. The skulls were painted by local artist Ryan Haworth. This is definitely a contest that will raise the standards among all other contests and I’m hoping we see something similar expand into other action sports. The trend in skiing and snowboarding these days seems to be headed in the direction of more and more back country riding. Whether it’s a back country hit or a just touring, the back country is receiving more traffic than ever before. Although it’s good to see people progressing and enjoying the back country, it can also be a serious cause of worry. Most people that enter the back country have no experience whatsoever with avalanche safety or avalanche awareness. I want to use this post as a reminder to anyone that is planning on going out of controlled areas. You should, at the very least have a basic knowledge of avalanche safety and know what to look for so you can minimize the risk of being caught in a slide. Most states that have any kind of serious back country terrain have websites that forecast avalanche danger. Utah, for example, has many sites that help educate people on avalanche basics. Also offered are classes that use hands on experience taught by professionals. Utah Avalanche Center is a site that offers classes, forecasts, and information on avalanches throughout the state of Utah. Whether you are a first timer in the back country, or a veteran, it is always wise to check avalanche forecasts before setting out for a day of pow riding. Continued learning courses are also recommended, even if it’s just a refresher course for someone who is well rounded in back country travel. 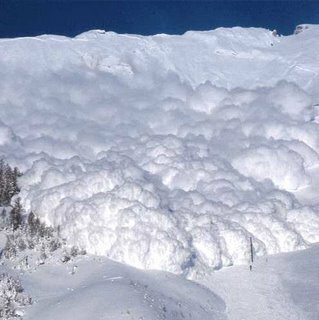 There are many false thoughts and ideas that are circulating around about avalanches and you should be aware of both common truths and falsities. Many deaths occur each year as a result of common mistakes made by inexperienced visitors. Remember, when it comes to avalanches you can never be to safe. Next years Poor Boyz Productions movie, Reasons, is set to be one of the best the industry has possibly ever seen. Setting the stage with an all-star cast including; Jon Olsson, Pep Fujas, Eric Pollard, Simon Dumont, Tanner Hall, Andreas Hatviet, Mark Abma, Peter Olenick, Sammy Carlson, Tim Durtschi, Mike Douglas, Chris Benchetler, Charles Gagnier, JP Auclair and Michelle Parker, Poor Boyz try to provide the “Reasons” why skiers do what they do. Bringing together such a cast has never been done on such a large scale. From X Games medalists to some of the best back country skiers out there, Poor Boyz covers all the bases for what is set to be an incredible film. Each cast member will bring something unique and innovative to the table. From back country hits to urban rails, park to big mountain lines this movie will show all different aspects of the progressing sport. A documentary format will allow the viewer to be able to see the triumphs and disappointments of the season, the ups and downs, the work and the “Reasons” behind a lifestyle sport. Check out the Reasons trailer. This coming week of Jan 29th-Feb 1 is the annual Snowsports Industries America expo, better known as S.I.A. With over a thousand snowsports companies in Vegas showing new product for the coming year, this is a chance to have a seek peek at new skis, boards, boots and bindings that will be released to the public for the ‘08 – ‘09 winter season. Some of us , I for one can’t wait to see the new ski line up. Fortunately there has been an expo in Sweden already so I did get somewhat of a sneak-peak. If you’re anything like me this is a major event and you can check out a few new skis at Freeride. All the buzz these days seems to be about the next rockered or reverse camber ski. Well there are a number of new designs and skis that will be flooding the market next year. If you haven’t tried a reverse camber or rockered ski in the powder you’re missing out. This shape seems to be the new trend, as with good reason because there is nothing else that compares in the pow. S.I.A. is the place to learn about new product straight from the source, the ski companies and the reps themselves. This year S.I.A. is going to be bigger and better than ever. If you don’t have the chance to go for yourself I recommend reading the online forums the next few weeks to keep up an eye on what’s happening in the industry. S.I.A. is a one of the most important expos of the year and helps show the coming trend for the next season. Keep your eyes open and ears tuned for any info on the expo. I am sure you won’t be disappointed, it’s going to be awesome. Citing the need to give big-mountain riders an opportunity to display their style and skill, North Face has recently unveiled their plans for a two-stop big-mountain tour. The inaugural 2008 North Face Masters will hold its first competition at Snowbird, UT. on Feb. 8-12 while holding the closing stop of the tour April 2-6 at Alyeska, Alaska. For decades, the world has seen the sport of Snowboarding grow rapidly in many forms, with amateur and professional competitive outlets for half pipe, park, snowboarder-cross, and traditional racing …yet until the introduction of The North Face Masters Tour, Big Mountain snowboarders, even those publicly embraced heroes at the highest level of their sport, have not had the opportunity to put their skill and talent to work against other athletes in a competitive arena. With the tour, North Face is making a serious push at being the main face of Big-Mountain Snowboarding. The make it pretty clear on the tour site, that they believe they are filling a major void in the industry with these events. By limiting the this inaugural tour to two events and wisely selecting these two legendary mountains to hold them on there is a real possibility they may do just that. Can it seriously be possible that we are now beginning the year 2008 and there are still mountain resorts in the United States that are getting away with banning snowboarders from their hills? Unfortunately, and unbelievably, the answer is yes. While we are now down to the final four mountains that refuse to lift their snowboarding ban, it’s still not good enough. Mad River Glen, Vt., Taos, New Mexico, Alta, UT., and Deer Valley, UT. all somehow continue to institute a ’skiers only’ policy. Apparently the godfather of snowboarding, Jake Burton, has had enough. Burton is encouraging all of us fellow knuckle-draggers to band together and peacefully protest this atrocity at each of these mountains. On Dec. 15 of last year, a sneak attack was led on Mad River Glen. About 40 white-clad boarders organized themselves at Burton HQ, conveniently located 45 minutes from MRG, for an early morning sneak-attack. They were armed with donuts and smiles, taking an early morning hike up the mountain and catching the elitists before they even knew what hit them. With cameras rolling, the brigade took to the hill while on-lookers below gathered to see their mountain being poached. Once the group made it to the bottom they proceeded to greet skiers with donuts and a friendly hello while staging a peaceful picket line in protest of the continued segregation. In addition to the protest that already took place, Burton is encouraging snowboarders to poach other mountains and submit a video that documents their experience, and the best video will be awarded with a cash prize worth $5000. So far there are no user generated videos posted on the site. Is that a sign of a failed attempt at Burton trying its hand in social media marketing? Or is simply because snowboarders don’t care enough that only four out of the hundreds of mountain resorts in the U.S. don’t allow boarders? I’m sure each of these resorts has their reasons for limiting their guests to two-plankers, but at this point those reasons just don’t fly anymore. There simply is no way that these mountains can continue to justify picking and choosing who is allowed on their slopes. Burton has it right as he continues to encourage more of these peaceful poaching-protests, even going as far to call it our “patriotic duty.” Poach away my friends, poach away! !